ShiKai Borage DiabetiCare Hand & Body Lotion, 8 oz. ShiKai Borage DiabetiCare uses powerful OMEGA-6 oils to promote the formation of healthy new skin cells for long-lasting results. Ideal for all-over body use. 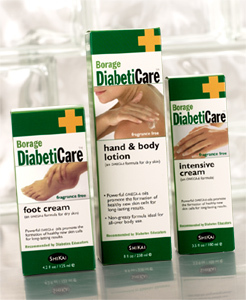 DiabetiCare's non-prescription, clinically-proven, fragrance-free formula prevents and relieves dry, cracked skin. It's not greasy and absorbs easily. No animal ingredients or testing. 8 oz. 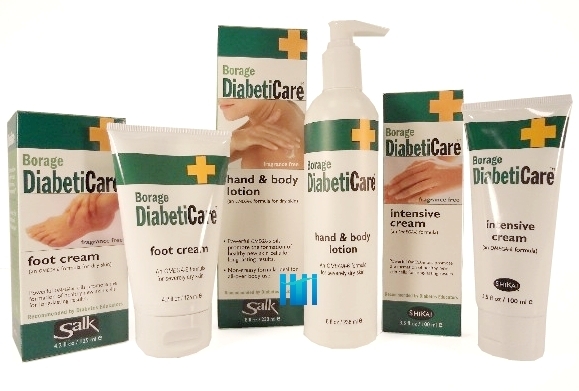 In addition to the Borage Foot Cream, HighTideHealth.com also offers Borage DiabetiCare™ Foot Cream; and Borage DiabetiCare Intensive Cream for severe dry skin often associated with diabetes.